The Farfa Abbey is one of the most important monuments of the European Middle Ages; He had the patronage of Charlemagne and possessed, in the heyday, a vast portion of Central Italy. The origin of the Abbey is still uncertain, although the most recent archaeological excavation led by prof. David Whitehouse, director of the British School in Rome, have verified the existence of a complex of the Roman period under the current Abbey. The almost certain identification of Lorenzo Siro with the bishop of Forum Novum (Vescovio) of the 554 ascertain the creation, in the sixth century, a center for faith and wealth. The Lombard invasion once existed a basilica and monastic buildings. According to legend, the last two decades of the seventh century, Thomas of Maurienne (or Maurienne), who lived in Jerusalem, following a vision of Our Lady, urged to go to Sabina, precisely in Acuzza, the remains of a basilica she dedicated the rebuilt work built by bishop Siro and gave rise to a re-foundation of the community. In the early eighth century, the monastery enjoyed the protection of the Duke of Spoleto Faroaldo II. Farfa was an Imperial Abbey as well, free of the papal control but close to the Holy See. In a few decades it became one of the most known and prestigious centers of medieval Europe; Carlo Magno, a few weeks before he was crowned in the Capitol, he visited the Abbey and stopped there. To understand the economic importance of Farfa just think that in the third decade of the ninth century, under the Abbate Ingoaldo, it owned a commercial vessel exempted from the duties of the Carolingian Empire ports. Also in this period was the enlargement of the monastery. The main church, dedicated to the Virgin, was enriched with a second apse dedicated to the Savior, with a ciborium all onyx, flanked by two towers. In the abbey treasure bore, in recent years, among other things, a golden casket adorned with pure gemstones (gift of Charlemagne), a gold cross with precious stones over a meter long, two gold crosses with relics the Cross, fourteen silver chalices, two gold crowns and silver and four gold seals. The decline of the Carolingian Empire and the Saracens were fatal Abbey. Seven years resisted the Abbot Peter I with his troops, and eventually divided monks and treasure into three parts, left Farfa. The Abbey was taken and set on fire. 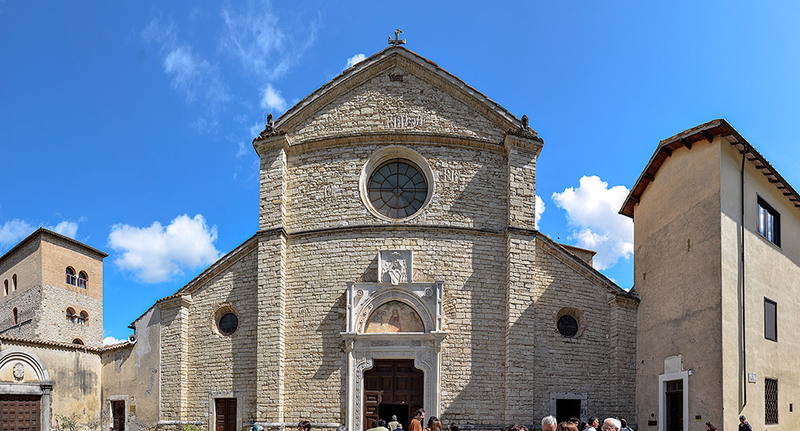 Of the three groups, the first founded Santa Vittoria in Matenano Marche, the second was murdered in Rieti by the Saracens and the third, who had escaped to Rome, returned to Farfa once the danger below the Ratfredo guide who became abbot in 913 he completed the church. But it was a fluke, lost imperial protection loosened the territorial unity. Some Roman families (Crescenzi-Ottaviani and Stefaniani) settled in the territories of the Abbey and became actually owners, the decline was such that there were three abbots at the same time within the Abbey fighting each other. The last recovery of Farfa was due to Abbot Hugo I (997 – 1038), not coincidentally with the contemporary imperial revival at the hands of the dynasty of the Ottos. In 999 was introduced was born in Cluny reform. Berardo I (1047 – 1089) Farfa summarizes the Imperial Abbey and in the investiture controversy is opposed to the Popes and in favor of Henry IV with the result that, in 1097, the monks decide, for safety reasons, to transfer the abbey on the nearby mount Acuziano where even today you can see the imposing ruins of the work started and never finished. The possessions of this period Farfensi are vast, you can read in a diploma of 1118: Emperor Henry V reconfirms abbey relevant areas of St. Eustace and Palazzo Madama in Rome, Viterbo, Tarquinia, Orte, Narni, Terni, Spoleto, Assisi, Perugia, Todi, Pisa, Siena, Camerino, Fermo, Ascoli, Senigallia, Osimo, Chieti, Tivoli, the area of L’Aquila, Molise, the port of Civitavecchia and half of the city. Coal Tomacelli, Cardinal nephew of Boniface IX, at the beginning of the fifteenth century was the first Abbate Commendatory. He did not return certain prestige of the past centuries, but in some cases the noble families who possessed with the Institute of Commenda, the monastery, they improved the facilities. Orsini in the second half of the fifteenth century, built the present church which was consecrated in 1496; Barberini reorganized and enlarged the village, largely used for the two great. fairs of March 25 and September 8, to commemorate Annunciation and Virgin to whom the church is dedicated. Farfa in 1798 was sacked by the French and in 1861 it was confiscated by the Italian State. Since 1921 the Abbey belongs to the Benedictine community of St. Paul Outside the Walls. Let us now the architectural aspect which is revealed to the visitor. Through a Romanesque portal of the fourteenth century (with added Gothic) leads to a courtyard in the background of which opens the Abbey Church consecrated to the Virgin, dating from the second half of the fifteenth century. Note above the Romanesque portal, in the lunette, a fifteenth-century fresco. In the church walls you can be distinguished fragments of early Christian sarcophagi. The interior of the basilica has three naves separated by two rows of elegant Ionic columns, on the back wall a large oil on the wall representing the Last Judgement painted in 1561 by the Flemish painter Henrik van der Broek. Frescoes of the sixteenth and seventeenth centuries representatives Stories of the Virgin, saints and biblical stories decorate the apse and aisles; to be reported in the first chapel to the right a Crucifixion (copy by Francesco Trevisani), in the second a Madonna with Child and Two Angels called Madonna of Farfa, revered the table of the thirteenth century, covered (in the nineteenth century.) by a brass plate embossed that leaves only the faces visible. At the door of the Basilica, in the transept and apse they are back to light interesting ruins: a Carolingian period altar and a section of wall painted with an image of the Abbot (the so-called Arcosollo of Altperto) that prof. Whitehouse, carefully reading the surviving stretch of writing, recently identified as S. Lorenzo Siro. In the three chapels of the left aisle they have worked Orazio Gentileschi and his students. The teacher are the three paintings representing St. Ursula (The Chapel), the Madonna and Child (The chaps. ), Crucifixion of St. Peter (III chaps. ), Students of the frescoes that decorate the interior of the chapels and which depict episodes of sacred history. In the transept it is visible, in part, the original floor of the middle of the ninth century. In the left transept of the Chapel stand the severe images of the founders of the Abbey of Farfa: St. Thomas of Maurienne and San Lorenzo Siro. In the ceiling of the transept and the choir should be carefully observed the little usual (a sacred place) grotesques of the Zuccari school. The wooden choir apse is the early seventeenth century. Before leaving the church, looking up, you can admire the coffered ceiling of 1494 with the coat of arms of the Orsini in a frame in the center of the nave. To visit are also the crypt in semicircular shape of the buckets. VII – VIII, in the atrium of which there is a beautiful Roman sarcophagus (late second century. D. C.) with battle scene between Romans and Barbarians, and the Bell Tower (buckets. IX – XIII), the basis of this ‘last, in a square room, they notice, although emaciated, interesting frescos of Roman school of the mid-eleventh century, representing Biblical stories and the Ascension. Going up in the upper rooms, in one of them, painted in a sottareo, some Prophets paintings in the fifteenth century. The visit to the Abbey you can finish asking to be escorted to Chiostrino Longobardo (with a Romanesque mullioned window of the thirteenth century.). and the main cloister dating from the second half of the seventeenth century, where sculptures and Roman inscriptions are collected; from here, a portal to the spearheads you pass in the current library with over 45,000 volumes, where some valuable codes. We can not leave this place without remembering the ancient Benedictine library and its prestigious Scriptorium. The sooner we can say with certainty that in the heyday (late XI sec.) Was one of the richest libraries of Europe; the second that had the ability to create a writing, under the rule of Abbot Hugh I, who assumed a distinctive feature distinguishing itself from all the other time-sensitive: the Tiny Romana in Scriptorium Pharfense becomes the Romanesque Farfense you will find glory in the works of Gregorio da Catino (1062 -1133), author of fundamental importance to the Italian and European history of the Middle Ages. You should also visit the premises of the new Museum, under construction, set on the ground floor. Section Archaic are shown the archaeological materials belonging to the peoples who lived in the ancient Sabina (much larger current) from the nearby town of Colle del Forno. Exceptional testimony of this italic culture, ignored for too long and still little known, is the Cippo of Cures, the only one of epigraphy Sabine stone of the late sixth century. B.C. The precious find, not yet fully understood, was found in March 1982 in the bed of the stream Farfa. In the medieval section we highlight, among other things, a school in Ivory Coast box set of the second half of the eleventh century, a painting by the early sixteenth century representing the Virgin and Child with an Angel and two end tables opistografe fifteenth representatives S. Lorenzo Siro and St. Benedict and St. Thomas of Maurienne and San Placido of a schoolboy Antoniazzo Romano. Released from the Abbey, before leaving Farfa, you should visit the little village with terraced houses of the same height. Once these lodges, during the great fairs of April and September, they were rented by the monks to the most wealthy merchants who agreed therein. With donations of Farfa Duke became a small autonomous state between the patrimony of St. Peter and the Lombard duchy. In 774 I’Abbate Sabine Probato, governor of the Abbey, he substantially changed the policy, taking the side of the Franks, and then the Papacy, in the war between the Lombards and the Franks. In the following year Charlemagne granted autonomy to Farfa the privilege from any civil or religious power, hence its splendor, its richness.